When a Sponge Cake is baked in a sheet pan and then rolled around a filling, it is called a Roulade (for the French), a Jelly Roll (for the Americans), and a Swiss Roll (for the English). No matter what you call this type of cake, its pretty pinwheel design, its delicious flavor and its soft, melt-in-your-mouth texture, make it a favorite. 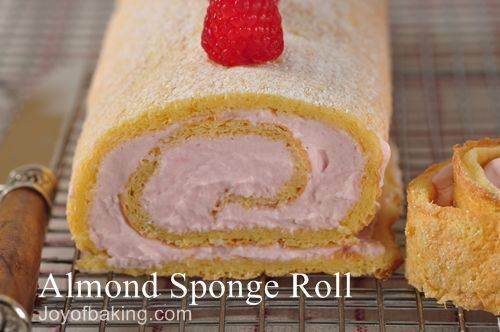 I love this Almond Sponge Roll's subtle almond flavor which goes beautifully with raspberry flavored whipped cream. This recipe is almost the same as the Sponge Cake recipe on the site, only the cornstarch (corn flour) was replaced with ground almonds. A dusting of confectioners (powdered or icing) sugar is all the garnish it really needs. Sponge Cakes are light and airy cakes made without a solid fat and contain more eggs and less flour than butter cakes. The leavening comes from the air whipped into the eggs. You will notice that this recipe uses a combination of cake flour and ground almonds, which gives the sponge cake a subtle almond flavor. The egg yolks and egg whites are beaten separately and this method produces a flexible sponge cake that doesn't crack when rolled. As soon as the sponge comes out of the oven it is rolled up with a towel and left to cool. This sets the shape of the roll and also helps to prevent cracking. Once the sponge cake has cooled it is unrolled, a raspberry whipped cream is spread over the cake, and it is rolled up again. The filling is whipped cream to which is added raspberry jam, but you may want to try other flavors of jam or preserves. The assembled cake can be eaten right away, but I find it best if the cake is refrigerated for a few hours, or even overnight, which sets the cake yet softens the sponge, which gives it that melt-in-your-mouth texture. Note: Cream of Tartar - Lining the inside of wine caskets after fermentation is a white sediment (tartaric acid). Once this sediment is removed, purified and then ground, it becomes a fine white powder which we call cream of tartar. Cream of tartar is added when beating egg whites to stabilize the whites and give them volume and strength. Cream of tartar can be found in the spice section of most grocery stores and should be stored in a cool dry place. 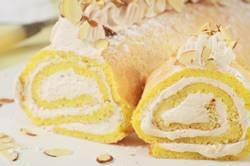 Almond Sponge Roll: Preheat oven to 350 degrees F (177 degrees C). Place almonds on a baking sheet and bake about 5-7 minutes or until lightly browned and fragrant. Remove from oven and let cool. Then place the nuts in a small food processor, along with 1 tablespoon of the flour, and process until finely ground. Transfer to a bowl and whisk in the remaining 2 tablespoons of cake flour. Increase the oven temperature to 450 degrees F (230 degrees C). Butter, or spray with a non-stick vegetable spray, a 17 inch x 12 inch (43 x 30 cm) baking pan, line with parchment, and then butter and flour the parchment paper (or spray with a vegetable/flour spray). Meanwhile, while the eggs are cold, separate two of the eggs, placing the yolks in one bowl and the whites in another. To the two yolks, add the additional yolk, and the two remaining eggs. Cover with plastic wrap and bring the eggs to room temperature (about 30 minutes). Then place the yolks and whole eggs in your mixing bowl, fitted with the paddle attachment (can use a hand mixer). Add 1/2 cup (100 grams) white sugar and beat on high speed for about 5 minutes, or until pale, thick and fluffy. (When you slowly raise the beaters the batter will fall back into the bowl in slow ribbons.) Beat in the vanilla extract. Sift half the almond/flour mixture over the egg mixture and gently fold in with a rubber spatula. Sift the remaining almond/flour mixture over the batter and fold in. Raspberry Cream Filling: Cover and chill the bowl and whisk in the freezer for about 15 minutes.Then beat the cream until soft peaks form. Add the jam and sugar and beat just until stiff peaks form. Unroll the sponge, spread with the filling, and reroll. Transfer to a serving platter, cover, and chill in the fridge for a few hours. Just before serving, dust with confectioners sugar.